Latesha Thomas is a beautiful, young African-American woman who lives with her handicapped father. She is in her final year of university and they are having a hard time making ends meet. She decides to start a matchmaking service to make a little extra money, though she has no experience and it turns out to be a disaster. She does, however, meet a client, a handsome white man named Peter Elsworth. The sparks fly immediately, but there’s a huge problem. Her father, and his mother, are vehemently opposed to an interracial relationship. This leads to tremendous conflict, but their love will not be denied. They grow closer, yet the closer they become, the more the tension rises. In time a secret connection between their two worlds become clear and this adds another dimension of conflict and complexity. But love is color blind and they are irresistibly drawn to one another. I don't think I've ever read a book quite like The End of the Line. And I mean that in a good way. The End of the Line was a good, clean read with a great message. I really enjoyed it! Latesha is a university student who lives with her wheelchair-bound father. She is an intelligent, compassionate, good-hearted young woman who is considered the princess of Beechwood (the community where she lives). Peter is an electrician who comes from a rich white family. Both families have a history of racist thinking: when Peter and Latesha become interested in each other, they each get a lot of pushback from their parents. Despite their parents' disapproval, their relationship grows and they can't deny their attraction to each other. At first, I thought The End of the Line was slow and that it was going to be a book that I had to push myself to finish. But then, I got accustomed to the pace of the story and appreciated that Power uses each small detail to perfection in furthering the plot. The End of the Line is a faith-based story, which I loved, with many scenes occurring in Latesha's church, or with her church members. This book was full of history and emotional impact. There were references to the Underground Railroad, and black history was also a major theme. I really enjoyed that aspect of The End of the Line as it made the book more interesting and meaningful. I loved that Latesha's family history was a big part of the story, and the way she brings her family's history up with her father, making her case for dating a white man, was really powerful. I found myself tearing up at several key points, because the story was emotional and so meaningful. It's rare to find an adult read that is as romantically pure as The End of the Line without the book feeling "holier-than-thou" or preachy. Jim Power keeps the romance deep-feeling, but the characters do no more than kiss. I really liked that: sometimes clean reads feel lacking in emotion, but not with this story. When an author keeps the story clean, everything takes on more importance: holding hands is a big deal, looks passed between characters are full of passion, and love can be declared with a kiss. I appreciated that aspect of this story, and I love the fact that it's a book anyone of any age group could read. The one thing I didn't like about this book is that the phrase "the end of the line" was used too often. It's a pet peeve of mine, when the title of a book is mentioned often in the story. It's distracting for me. Others probably would never notice it, but I'm picky that way. The conflict resolution was perfect and really touching. 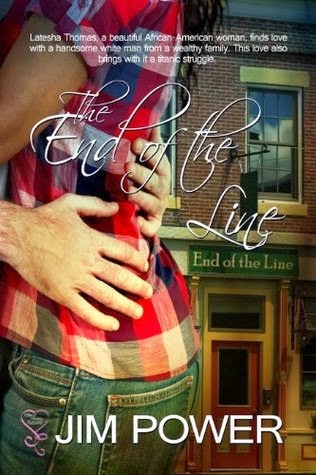 The End of the Line starts off as a simple story, but it had a great emotional impact on me. I recommend it and look forward to reading more from Jim Power! aww wow, sounds very different. Good to know that it's a clean read that didn't lack in emotion!